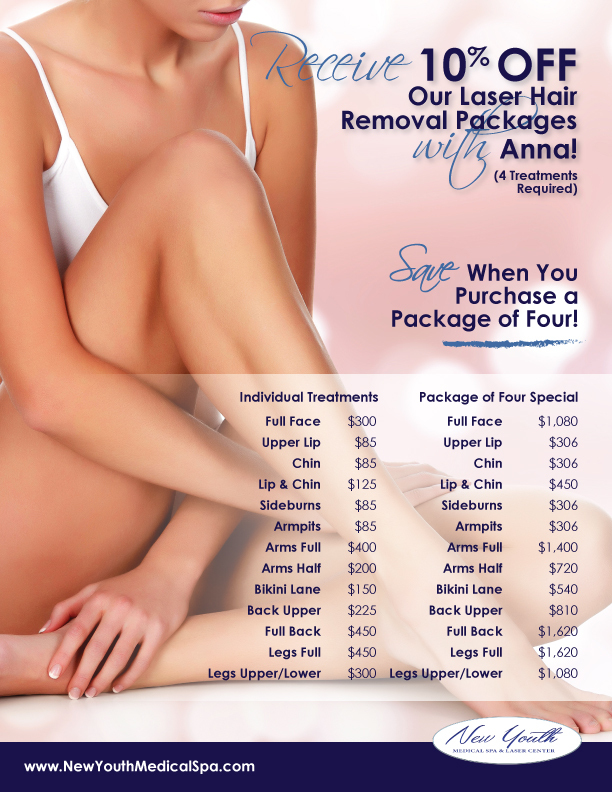 Laser Therapy and Light Treatments include a laser designed to eliminate undesired hair from the body. A pulse of light is delivered to the skin through a chilled hand-piece allowing the light to penetrate the skin and damage the root of the unwanted hair. 6 to 8 sessions are usually required. Blonde or grey hair needs to be pre-treated in order to be effective. Light energy is delivered through a laser hand-piece targeting the spider vein in a series of brief pulses. The light energy is absorbed by the blood vessels causing a coagulation effect, allowing the vessels to be reabsorbed by the body. This FDA approved laser system requires a deep mechanical massage. Pressure is applied to the tissue below the skin, resulting in a tighter appearance and the reduction of visible cellulite. Multiple treatments are required for optimal results. This treatment is not painful. It smooths and tightens areas with cellulite on the legs, buttocks, stomach, arms, and back. Your face can also benefit from this treatment as it can temporarily improve the appearance of fine lines and wrinkles and improve volume. The facial tissue appears more relaxed and balanced with a fresh glow. Patients may require up to 16 individual treatments with monthly maintenance treatment. The Genesis Laser is a high-frequency laser beam that is uniformly applied over the face and neck (also the body), depending on which area is treated. Genesis Laser Treatments will close enlarged pores, “plump up” fine lines as well as stimulate collagen growth and reduce scars. This treatment is ideal for Face & Body Rejuvenation and can reduce the appearance of stretch marks and acne scars. Our Expert Anna will be determined how many treatments you will need based on your individual treatment goals and her expertise. Treatments are performed with a non-invasive medical system that uses an intense pulsed light therapy to reduce melanin, the dark pigment in your skin. The light energy is gently delivered to your skin in pulses through a controlled handpiece. Areas treated will gradually fade and slowly disappear. Multiple treatments may be required, scheduled 4 to 8 weeks apart. Can treat freckles, age spots, rosacea, spider veins and more. A non-surgical skin enhancement procedure. It uses safe, infrared light instead of radio frequency to cause the collagen in the skin’s dermis to contract and tighten. It can be used on all areas of the body where the tighter skin is desired. Depending on the skin’s laxity, multiple treatments may be required. Results are gradual and may take from 3 to 6 months to maximize the effects. Say Goodbye to Toenail Fungus. Finger and Associates and New Youth Medical Spa are proud to offer the best laser technology currently on the market and approved by the FDA the Cutera Laser for toenail fungus. The Laser light passes through the nail killing the fungus without damaging the surrounding tissue. Patients who have suffered for years with unsightly and discolored toenails can successfully treat toenail fungus without the application of a sticky medication, which takes months to work if it works at all. The laser treatment takes about 20 minutes. No pain medication is necessary following the procedure, and you can go right back to work the same day. It’s painless, safe and effective. Results are not seen immediately. As the new nail grows in, it will show signs of a normal nail from the bottom of the nail bed, as it grows. This may take 6 to 12 months, according to how fast the nail grows. Generally 4 to 8 treatments scheduled three weeks apart. This allows many of the benefits of invasive laser skin resurfacing without the downtime, side effects and lengthy recovery period. The treatment produces thousands of tiny but deep columns of microthermal treatment zones which eliminates old epidermal pigmented cells. It leaves the surrounding tissue unaffected and intact so the skin heals much faster. Each treatment targets between 20 to 25% of the skin’s surface. 3 to 5 sessions will be needed, spaced about 4 weeks apart. Optimal improvement is usually visible in about 2 to 3 months.